At RegularLabels, we offer a more economical line of quality labels, including BOPP and paper. You can get the labels you need for your consumable products and know the labels are manufactured for high use performance, such as a label on a squeezable bottle. Our regular labels stand up to the constant and extreme short term use you subject them to. Looking for a label that fits your need? We’ve got you covered! With a professional approach but a personalized touch, your consumable labels will be created to your specifications, finished to match your application requirements, and shipped to your doorstep, arriving right when you need them. 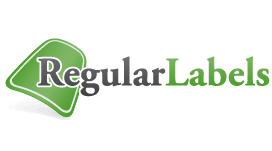 Whether you are looking to label food packaging or health and beauty supplies, RegularLabels is the place where you can order low cost, custom labels, digitally printed to your specifications and perfect for all your disposable label needs.! "I got the labels and they look very nice. As usual, you guys do a stellar job." "The labels are great! We haven’t had any issues with them and are very pleased with their quality." RegularLabels are custom printed on disposable recyclable materials, which makes them the perfect label for any event. RegularLabels are printed to match your specifications and formatted to work with your label applicator. We care about the little details and it is important to us that you know everything. Clear BOPP labels allow your product to be visible and still have all the necessary wording included on the label. Your logo can appear transparent or be printed with white ink behind to make your brand really pop out. Our white BOPP labels are the “go to” standard when you need chemical resistant product label. All the needed information will be printed clearly on the label and be easy to read. White BOPP labels are water and oil resistant, as well as economically priced. You can feel good knowing you have a dependable label that works for the time you need. Send us your Design and we'll make the Custom Label!